An aging Mr. FishDuck cannot change his look, but he can change the theme or appearance of the site! 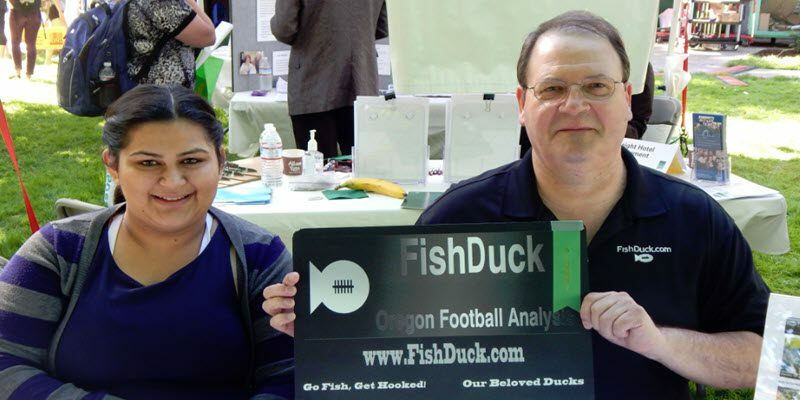 The photo above was taken at a UO Job Fair four years ago and I’m seated with Pat Pannu, who wrote over 100 articles for FishDuck.com over her college career. I enjoyed working with her and with another Job Fair coming up this week–the picture was a pleasant memory. Why the big change? To better accommodate the growing mobile use (cell phones and pads) that are now on the site more than desktops. You will note the “slider” at the top of the home page is gone so that you don’t have to wait five seconds for each of the last six articles to sweep past–you can quickly scroll down and see what you have missed in recent articles. Handy! All of the items in the margins, or widgets have been discarded because on mobile they were just being stacked up in one column anyway, so we replaced all the links that can now be found on the upper and lower toolbar. Cool! You won’t see many ads either as we made almost nothing on them anyway, so they are at the bottom of the one column. One thing I like is how everything is more efficient, and the tremendous pictures given to us by FishDuck.com photographers really pop with their vivid colors. You will note also that the green in the margins is not the current candy-apple green, but the rich green of yesteryear. And besides–I am sure this color will rotate around again! Something that all of us who write who have to get accustomed to is how we will now be placing pictures differently than before–again to work best with the majority on mobile devises. There will be a touch fewer pictures, but they will be bigger and take up the entire space as opposed being on one side or the other. Do know we have a number of tweaks to do yet–some links that aren’t right, little things that will be corrected in the next day or so. And if you are retired and looking to fill a few hours–let me know at charles@fishduck.com as we could use a hand on occasion. Always a lot of details to have articles up every day! As reported before–the changes referred to about becoming a subscription site are postponed indefinitely, if at all. Enjoy this free site and let’s make the most of it! Thanks again for your patience, and most of all–thanks so much for the incredible discussions we have in the comments. If you haven’t taken part, do give it a try as I enjoy learning from all of you and we are the only GUARANTEED TROLL-FREE Oregon website.